In the year 2000 the Industrial construction industry in Alberta had a gloomy outlook. The Oil companies where tripping over each other to get their mega projects started before their neighbors and as an industry we were just starting to wake up to the fact that we didn’t know how to manage them. In 2001 The Construction Owner Association of Alberta (COAA) formed a committee to look at what could be done to improve construction productivity on projects over $300 Million. By 2003 they had developed the basic outline that showed: If you plan more, you get better results. Industry research continued over the next couple of years with hundreds of industry experts. The committee developed a fairly clear picture of the elements that were present when there was good productivity and what was absent when there was poor productivity. 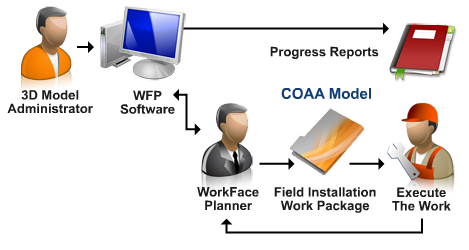 The committee used this information to develop the prototype model for WorkFace Planning (previously known as Workface Planning). Removal of Constraints (Ensuring that the work can be done before it is released). By 2006 the industry was starting to publically support the model and Oil companies were developing it as a standard requirement in their contracts. 2007 saw the development of a recognized training provider: ASI through SAIT and the launch of Insight-AWP and our Advanced Work Packaging facilitation team. By 2008 we had several projects set up and were developing a very good understanding of what it actually took to be successful. In 2009)we have seen the development of a guidebook on WorkFace Planning: Schedule for Sale authored by the founder of Insight, Geoff Ryan. The book offers a detailed step by step guide to Advanced Work Packaging (see book excerpts here) along with explanations of the logic behind the concepts. It can be previewed and purchased from our publisher here. Advanced Work Packaging is the creation of small, well defined, Field Installation Work Packages (FIWP) for the construction workforce. A typical FIWP is one rotation of work (5 or 10 days) for one crew in one discipline. The FIWP is a dissection of the schedule and an element of the Superintendents execution plan. Each FIWP has a standard list of constraints that must be satisfied prior to the work being released. These constraints are a list of all of the things that a Foreman will need to execute the work: Documents, materials, scaffolds, permits etc. The FIWPs are developed and managed by WorkFace Planners who are developed from trade supervisors. These Planners are engaged at a rate of 1 per General Foreman or 1 per 50 tradespeople. what we should be doing (the schedule). what we can do (information, equipment, resources, and materials). what we are doing (actuals/reality). The application of Advanced Work Packaging will initially drive up the indirect costs of construction by about 2%, (1 Planner per 50 trades). The application of organized planning and execution creates cost avoidance through improved productivity at the workface. The cost of implementing Advanced Work Packaging is recovered when we improve the productivity of our work crews by 6 minutes a day (1%). This is based upon the accepted “Time on Tools” standard of 40%. Industry estimates have pegged the potential productivity improvements from Advanced Work Packaging at between 10 and 25%, this equates to a reduction in Total Installed Cost (TIC) of 4 to 10%. On one of the projects that we established the client had a fence down the center of the project and had two separate contractors, one using Advanced Work Packaging and one that did not. On the Advanced Work Packaging side of the fence pipe was installed at 2.6 work-hours per foot, averaged across the whole project. On the Non-Advanced Work Packaging side the contractor installed pipe at 4 work-hours per foot. While this evidence is anecdotal, the client has since mandated the use of Advanced Work Packaging on all future projects.